I may have been crushed by the Canucks’ loss in Wednesday’s Game 7 of the Stanley Cup Final, but it’s what happened afterward that angered and disappointed me more. 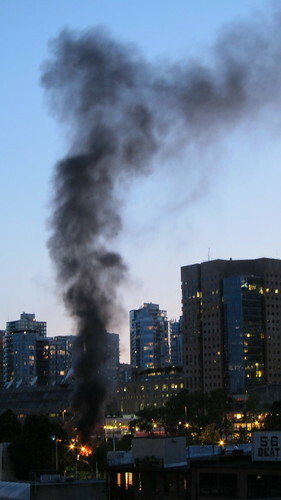 It’s a start, but given that the riot footage has been replayed by major news organizations worldwide, Vancouver has been given a black eye by, let’s face it, a very small minority of troublemakers who were going to cause chaos, regardless of whether the Canucks won or not. They did not represent Canucks fans (if, indeed, they are even fans), and they certainly did not represent Vancouver. And I’m sure almost everyone in the city agrees with me. Top photo credit: “Disgrace” by flickr user AaverageJoe. Bottom photo credit: “Few good people helping clean up the mess from many idiots…” by flickr user Chayuth.